^ Kington, Tom (7 April 2008). 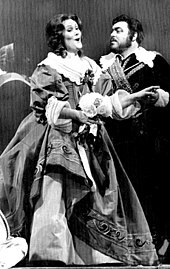 "Pavarotti mimed at final performance". The Guardian. London. Retrieved 2008-04-07. 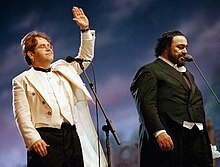 ^ "Pavarotti eisteddfod career start". BBC Online. 6 September 2007. Retrieved 2007-09-07. ^ Block, Mervin (15 October 2004). "'60 Minutes' Story About Singer Hits False Note". Poynter Online. Retrieved 2009-09-28. 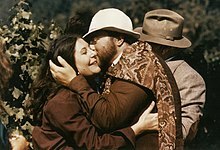 ^ "Pavarotti 'will return to stage'". BBC News. 25 July 2006. Retrieved 2007-09-05. ^ Crossette, Barbara (30 May 2001). "United Nations: Honor For Tenor With Midas Touch". The New York Times. Retrieved 2007-09-06. ^ Farhi, Paul (December 3, 2001). "Command Performance". The Washington Post. Retrieved 20 February 2017. 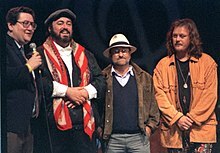 ^ "Freedom of London for Pavarotti". Entertainment. BBC News. 13 September 2005. Retrieved 2007-09-06. ^ "Black flag flies over Vienna Opera House for Pavarotti". Agence France-Presse. 6 September 2007. Retrieved 2007-09-06. ^ Castonguay, Gilles (6 September 2007). 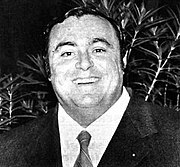 "Luciano Pavarotti dead at 71". Reuters. Archived from the original on 11 October 2007. Retrieved 2007-09-06. ^ Owen, Richard (11 September 2007). "Pavarotti's manager on his last days". The Times. London. Retrieved 2007-10-14. 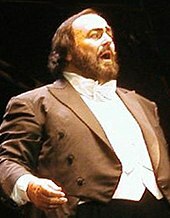 Wikimedia Commons has media related to Luciano Pavarotti.